Unlike most tracks in the nation, the huge Indianapolis Speedway provides many things to do on the inside of the oval track. Music Concerts - There is a stage set up in the plaza behind the Control Tower. There will often be bands performing there. 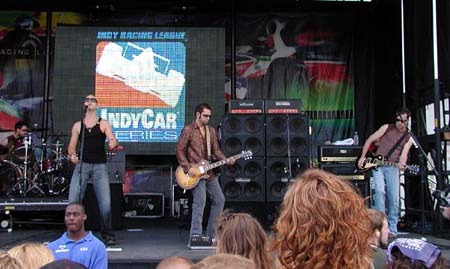 There is usually a nationally famous act performing on Carburation Day and during the Brickyard 400. The conerts are free too! 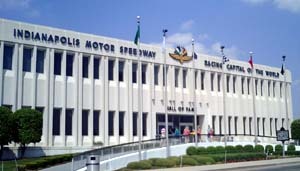 The Speedway Museum is located at the south end of the infield. They have many cool race cars. While most are Indycars, not all are. There is other memorabilia such as trophys, uniforms and pictures inside too. They have a small theater where you can watch films about the Speedway. There is a large gift shop inside. May Hours: -- 9 a.m to 6 p.m.
Tours - There are two tours you can take. There are busses which will take you on a lap of the Speedway on days when race cars are not practicing. You can upgrade to a full tour in which the bus will stop and let you out on the track at the start finish line where you can take pictures. A guide lets you tour the media center and the control tower. Tour tickets are purchased inside the museum. Prices for the bus ride only: Adults $3.00; Children 6-15 years old $1.00; Children under 6 FREE. Prices for the full Grounds tour: $25 for adults, $10 for youth age 6-15 and free for children age 5 and younger. Photoshop - There are two photoshops. The one most people want is located over in the Tower Terrace (the stands to the north of the Pagoda Control Tower.) You can find photos from just a $1 all the way up to huge framed photos for hundreds of dollars. The other photo shop is located on the 2nd floor of the Museum. They have an archive of negatives that go back through all the years! You can browse through binders of negatives, select certain frames and order photos printed of them! Car Displays - You may find these anywhere, but generally most can be found in tents over in the parking lot east of the Museum. Another likely spot will be over near Gasoline Alley, in some of the F1 Garages. Both of these places offer gift certificates! You are also likely to find Race Teams selling merchandise from trailers in the parking lot east of the musuem. There will also be many vendors outside the speedway, along Georgetown Road, selling stuff. The Speedway does not give you passes to get out and back in to the track, so you will have to check these vendors out before you enter or after you leave the speedway. After the race is over and everyone has left, you may find these vendors are willing to bargain. Also you may find someone walking around in the parking areas outside the track selling souvenir t-shirts for $10. These will be very low-quality tees. Local stores through out the city often have various race related merchandise too. 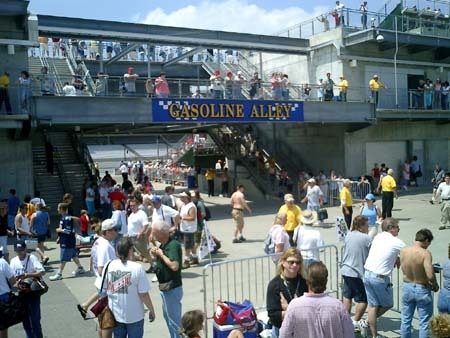 Gasoline Alley is the road the race cars and drivers take between the garages and the race track during the Indy 500. Hang out here and you'll witness a pretty constant stream of famous people and you may get some autographs or even a picture taken of yourself and a driver. The best time for this activity is when the Speedway is not real crowded, such as a practice day. 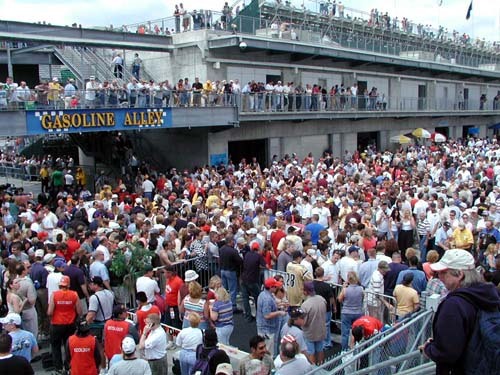 On busy days, Gasoline Alley gets packed! Garage Passes allow you to walk around the garages that connect to Gasoline Alley. 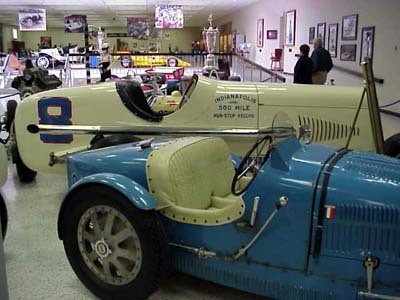 There are three long buildings full of garages that are used by Indycars and Stockcars. 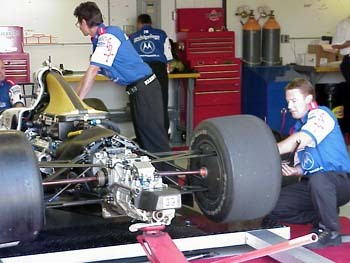 You will see the mechanics working on the cars. You'll see the drivers hanging out. You can usually get a few autographs. However getting such a pass generally requires that you have a connection with a team or sponsor. There is a pass that can get you into the garages for the whole month of May, but it costs $100. It's called a Bronze Badge and you can buy it from the ticket office. The F1 garages are right beside the track. Normally, you can't get anywhere around them. However, on the Thursday before the U.S. Grand Prix, the Speedway allows all ticket holders to come and check out the F1 garages. The teams are getting all setup. You might see some drivers. Pit Passes are even better than garage passes and they can usually get you into the garages as well! The best type of pit pass is the "hot" pass that get you into the pits when things start getting serious and everybody but the race teams and VIPs get kicked out. You cannot exactly buy a pit pass, you need to find a connection with a sponsor or team. 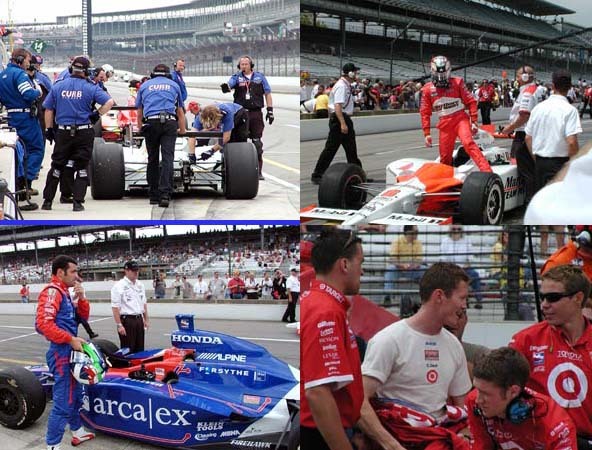 However, if you choose to become a 1-lap sponsor for the Indy 500 for $500, I believe you can get a pit pass for race day. 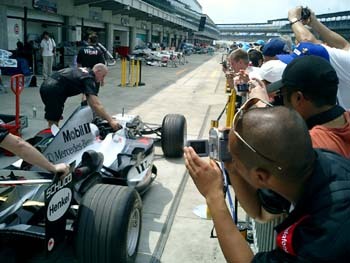 With a pit pass you can get up close to the action! - and without a fence in your way! Note: Children (under 18) are not allowed in the pits. Also, you can't wear sandals and you must be wearing a shirt in the pit area. You can't carry your cooler or drinks in. Surprisingly, you can smoke. Try and get invited to one of the many big tent partys. Free food, booze and entertainment. There are picnic tables and food stands behind the tower. Often there are forms of entertainment in the plaza which you can watch while you eat. You can tailgate and picnic almost anywhere you like. Its handy to do so near your car. Bring a grill, table, chairs, etc and have a party! There is a ton of free parking inside the grassy 3rd Turn infield, but you must get there early on race day! There is a grassy viewing hill that wraps all the way around the third turn and down along the back straight. Restrooms and a concession stand are handy. You can catch a shuttle to other points, such as the tower garage area, or museum. They play music over the P.A. system during those slow practice days. There is also a huge jumbotron TV there. Another good spot to tailgate is Turn 1. There are stands in this area. Get there early and park right up against the stands so that your party supplies are closed at hand. Fun for the Kids - You can usually find special activities for children around the Museum and over in the Plaza behind the Pagoda Tower. 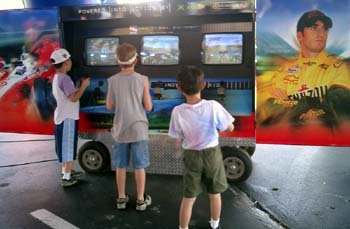 Video racing games, remote control cars or slot cars, and pedal car races are often to be found. Golfing - There is a 18-hole championship-caliber golf course in the infield and to the east of the track. It includes three lakes, 72 sand traps and 650 trees. It's not a course for the fainthearted and its expensive. To contact the Brickyard Golf Resort and Inn, call (317) 241-2500. 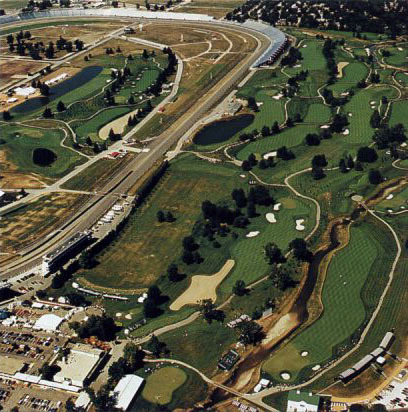 As you can see, most of the golf course lies east of the track. Only four holes are inside the famous oval. There is a tunnel for the golf carts to get go from one side of the track to the other. Its expensive, about $100. The carts have GPS systems. Indianapolis Raceway Park IRP has a .66 mile oval, drag strip, road course. Winchester Speedway 1/2 Mile paved oval. It is located 2 1/2 miles west of Winchester Indiana on State Road 32. Phone: (765) 584-9701. North Vernon Speedway 3/8 Mile dirt oval in North Vernon Indiana. Paragon Speedway a 3/8 mile dirt oval 30 miles south of Indy. Gas City Speedway 1/4 Mile dirt oval in Gas City Indiana. Bloomington Speedway - 1/4 Mile dirt oval in Bloomington Indiana. Plymouth Speedway 3/8 Mile paved oval in Plymouth Indiana. Speedrome - On SE side of Indianapolis - See midgets, bomber figure 8's, modifieds, bandoleros, legends, stocks, and roadrunners tear it up. Salem Speedway 1/2 Mile paved oval in Salem Indiana. Track Attack offers classes at the oval and road course at Indianapolis Raceway Park (IRP) and at their own half-mile 6-turn road course at 2525 N. Shadeland Avenue. They have deals for corporations and can travel to speedways outside Indiana as well. See their website for pictures of their race cars or call (317) 890-1519 or 1-888-RACETRX for more info. They also rent out the track to karters who have their own equipment. No Limit Racing Adventure offers racing classes at IRP also. They feature Nascar style vehicles for the oval as well as a "Lemans-style" car for the roadcourse. They also offer go-kart instruction for the beginning driver. Their phone is (317) 885-8878. Richard Petty Driving School offers classes in Nascar style cars at the Indianapolis Motor Speedway. Their karts have bumpers all the way around and can get up to 40 mph. They rent out to corportate groups of 5-200 peoople. They also offer race cars on an outdoor track - see Racing School section above. Approx Kart Speed: You bring your own kart, but karts are rentable for corporate groups. Notes: Track is 1-mile. There is also a 1/4-mile dirt track for karts. Located: 10 miles south of Indy on 31 in Whiteland. Price: $10 for 8 minutes or $25 for three 8-minute sessions. Notes: They run rain or shine. If you have your own cart, you can race all day for a small fee. These karts are more traditional and performance varies from kart to kart. Located directly west of Indy. Located on the southside near Emerson and I-465 next door to a huge bowling alley. They have putt-putt, video games, bumper boats, etc. Located on the east side of Indy. Located directly south of Indy, this place offers two kart tracks. One track offers two-seaters and single-seaters. Then there is oval designed for small kids to drive karts by themselves. They also offer miniature golf (putt-putt) and lots of video games.